A company’s intranet should be lively, dynamic, and useful. But how can you be sure yours passes this test? What is the point of investing resources in Intranet software when users don’t contribute and are unable to find the resources they need? You might be wasting significant time and money while generating feelings of frustration among employees. Your Intranet should be the place where your employees and coworkers collaborate, create, and share their knowledge. If they don’t and your software suffers from a dead silence, why bother having it? You spend money on operating and maintaining intranet software, and you spend money on your workers’ wasted time when they misuse your tool. So things have to be right for these expenses to make any sense. How can you discover your intranet dysfunctionality? The first step is to understand what’s really going on. You do use analytics tools for your website, right? Implementing an intranet analytics solution can provide you with all the information you need to optimize your organization’s collaborative space. The same rules about making empirical, data-driven decisions apply to both front-facing and internal online resources. This post will highlight some of the problems typically experienced by companies and other organizations deploying intranets and collaboration platforms like SharePoint and Confluence. Then we’ll try to suggest what can be done using analytics to get a grip on those issues. It happens in every company with an intranet: there are a lot more takers than givers. In other words, many more people will read content than produce content for your company’s intranet pages. Two obvious conclusions should be drawn from this: first, you need to identify your top contributors and find a way to reward them. These champions are a tremendous help to your organization, and they deserve recognition. The second conclusion is one that requires a little more consideration: you are failing to make the most of your employees’ knowledge! Our rule of thumb tells us that 4 of 5 employees are not sharing enough of their experience, expertise, and unique knowledge that has the potential to make your company better. How can intranet analytics help me fix this problem? Analytics can help you identify and track the individuals who are making the biggest impact on your organization. Customization of reports and data will generate statistics on document authors, wiki editors, and top commenters to see where your content is coming from. By the same token, you can determine where you have gaps in your intranet resources and who isn’t sharing expertise. Careful analysis of intranet analytics reports should give you a good start on creating action points that ultimately lead to content generation. If your reports show that the HR department isn’t producing content, you can cross-reference this with search data analytics and task someone with writing a handbook to answer common questions. Give the job to a person or a small group of people who haven’t contributed before, and assign a “mentor” from among your champions to help them. Including more people in the content creation process will improve results and give all of your employees a chance to place their expertise at the disposal of co-workers. 2. Clutter is making your websites unusable! Lots of teams, lots of websites, lots of documents crowding up things. If there’s too much junk, old content, or otherwise less-than-useful pages lying around, this will make navigation cumbersome and unpleasant. Think of it like your email inbox: when there’s too many spam messages in there, it stops being useful. Clutter kills email. Your internal pages are similar: too much junk will make them unusable. Use intranet analytics to figure out how you can cut the fat and keep the lean meat. And if you think we’re making this up, well, we’re not: the 2013 study by Interact titled Interact Intranet Customer Analysis Survey demonstrated that in organizations without well-designed intranets, 1 out of 5 working days is wasted just looking for the information needed to get the job done. How can analytics help me fix this problem? The entire reasoning behind using analytics for your intranet platforms is to capture levels of user engagement. If your analytics data tells you that visits to a particular page are steadily decreasing over time, review the content and decide whether it needs updating, archiving, or simply removal. This should be a regular process, something done by a team that uses reliable analytics data to see where you can remove barriers to information. 3. People can’t find the information they need! The primary purpose of company intranets and collaboration platforms like SharePoint and Confluence is to collect information and make it easily accessible. Knowledge is power, and knowledge at employees’ fingertips means increased productivity, which translates into better business results. The architecture of your intranet should make it as easy as possible to find information without getting lost or frustrated. If it takes too much time to find an important document, users get discouraged and abandon their search. Helping your users is a simple proposition: make the journey to the resources they need as painless as possible. “Pain” when browsing an intranet means going through too many pages to find a resource. Search results data might tell you that a resource is buried too deeply. If everyone’s looking for the same thing using your intranet search engine (similar or identical search terms), maybe that content isn’t easy enough to find just by clicking from the point of entry. Search phrase statistics can give you a clue as to what isn’t exposed enough. Another idea is discovering broken links that frustrate users by using this Piwik PRO ninja tip: set the “404 page not found” error message as a goal in your Piwik PRO instance. Then use click path reporting to see what brought users to this non-existent resource. Now you know where to fix your web pages to avoid users running into walls when trying to find information. 4. Users aren’t doing the things we need them to do! Intranets are also key tools for disseminating information across large organizations. Perhaps there’s a message from senior management or general counsel that everyone in the company needs to be familiar with. Perhaps new policy documents applicable to broad swathes of your workforce have just been put up. Or you may have placed an important employee satisfaction survey somewhere in SharePoint. You might think it’s obvious that employees need to see these things, but they don’t necessarily feel it’s so obvious. Track logins and page views, and treat key content and important pages like conversions. Use an analytics tool which allows you to set goals and follow events so you can monitor exactly the content you think is important, and then observe how it performs. If you have completion of a survey form as a goal, you can use funnel tracking to determine where and why users drop out of the conversion path. By applying segmentation, you can then learn if there is a certain class of users underperforming. For example, in a global organization it could be the case that your English-language survey is too hard for employees in Romania or Brazil to understand because they drop out of the survey after the second page of instructions. These are the kinds of insights that can help you improve your intranet performance. As we’ve said, your intranet represents a significant spend and extensive investments of an array of resources. It should serve the whole organization, but if it is designed and maintained poorly it will only work for a small percentage of employees, or none at all. 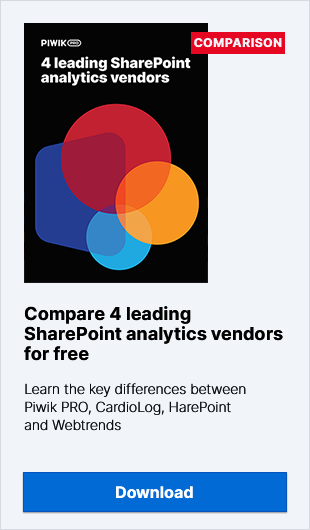 Generating insights you can use to improve your intranet and collaboration tools like SharePoint or Confluence requires a data-drive approach that only intranet analytics can provide.